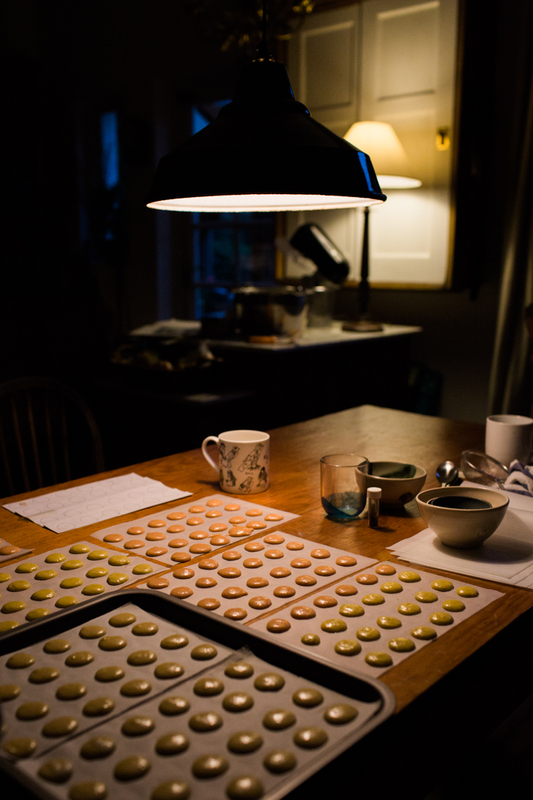 For the last few years, about a month before Christmas, my Facebook feed would suddenly be filled with my friend Nangi’s photos of her annual pre-Christmas mini-macaroon baking session. In an instant I’d be transported back to my Paris days where a walk to work involved gazing into the patisserie windows and admiring the edible miniature works of art. 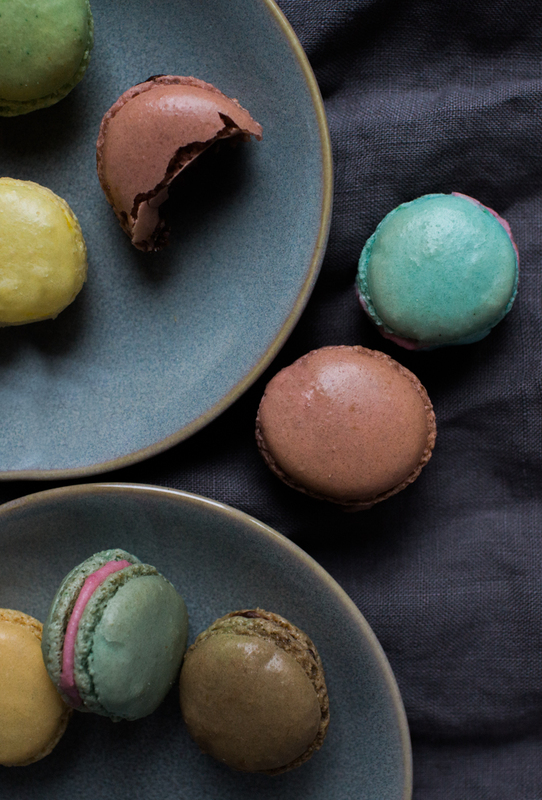 I asked Nangi if I could join her this year – I was really keen to learn how to make macaroons. She agreed and I quickly gained an insight into how involved the process could be when she mentioned ‘let me know when you plan to come and I’ll make sure I get the egg whites drying out a few days in advance’. I literally had no idea and was learning form scratch. 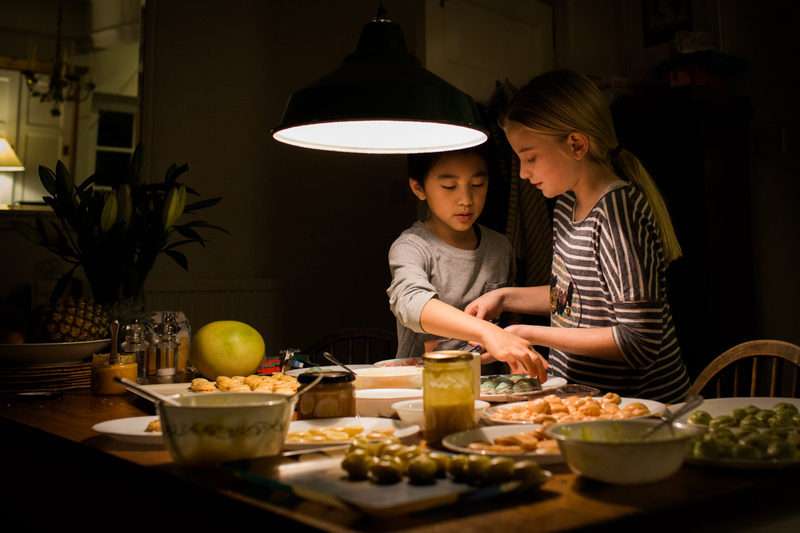 Our children (who are good buddies and have been frequent baking partners since the age of 4!) 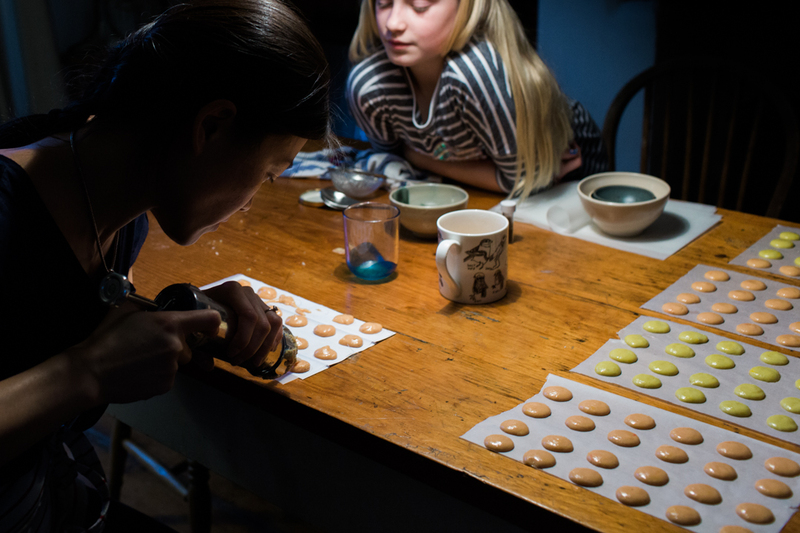 were our sous-chefs for the afternoon, or so we thought… they soon turfed us out of the prime spot at the kitchen table and set up a rather efficient production line; piping, pairing up and then finally filling all the little macaroons. I have to admit they weren’t the slightest bit slap dash and nobody fell out in the process so it was a lovely afternoon of indulgence, chatting with lovely friends whilst learning a new skill. 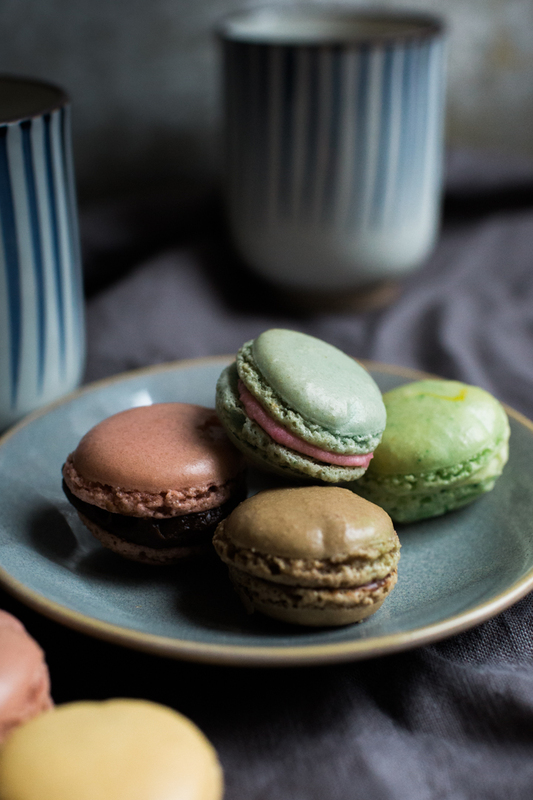 The story behind the macaroons is that Nangi makes them to share with friends each year over the festive season and is sure to keep a batch in the freezer ready to keep the family sweet over Christmas during social gatherings. She did mention that despite are various kits on the market these days for making macaroons, she favours the method of simply piping them direclty onto greaseproof paper. 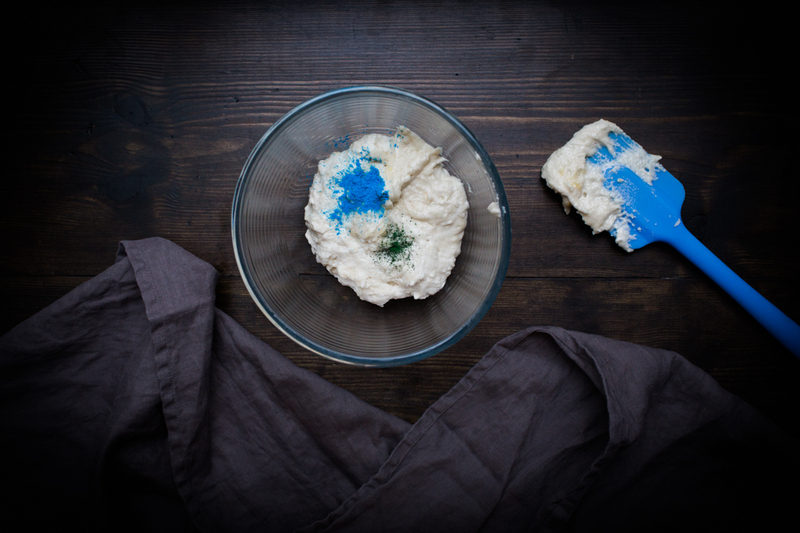 When it comes to the colours and filings of the macaroons, you can be as creative as you like really. Nutella, jam or buttercream are perfectly acceptable. Nangi had rustled up homemade fillings in advance and I can feel a whole new blog post of its own coming soon dedicated solely to her salted caramel. It’s official, every store cupboard needs a jar of it. To give you an idea, we made the following favours and they were all delicious in their own right: rose, passionfruit curd, salted caramel, peanut butter, raspberry, chocolate ganache and lemon curd. 2. Process the almond flour and icing sugar then whisk. 3. 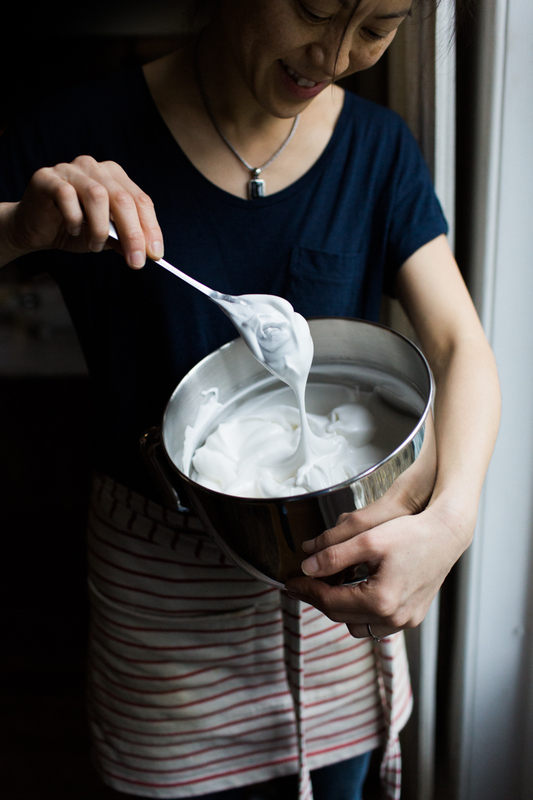 Beat the egg whites until they form soft peaks. 4. Gradually beat in the caster sugar until it is firm and glossy. 5. Sprinkle half the almond flour mixture and fold. 6. Add the rest and fold quickly. If you would like to add colourings to your mixture, now is the right time. 7. Pipe the mixture onto greaseproof paper using a template underneath (with pre-marked circles to guide you.) You can make yourself one easily, with little circles approx. 2cm in diameter printed onto a blank sheet of white paper to be placed underneath the greaseproof paper. 8. 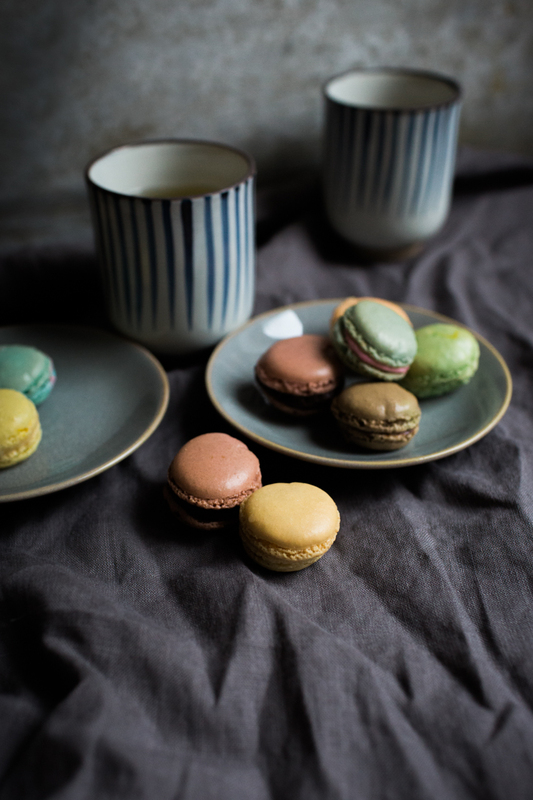 Once piped onto the greaseproof paper, dip your finger into a small bowl of water and gently tap the top of the macaroon mixture if there are any small peaks showing. Leave them to dry for approx. 30 minutes. 9. Carefully slide the sheet of paper onto a baking sheet /tray and cook for approx. 12 minute. Leave the door of the oven propped slightly ajar with a wooden spoon. 10. Once removed from the oven leave to cool for a few minutes then carefully peel them from the greaseproof paper and place on a rack or cool plate. 11. 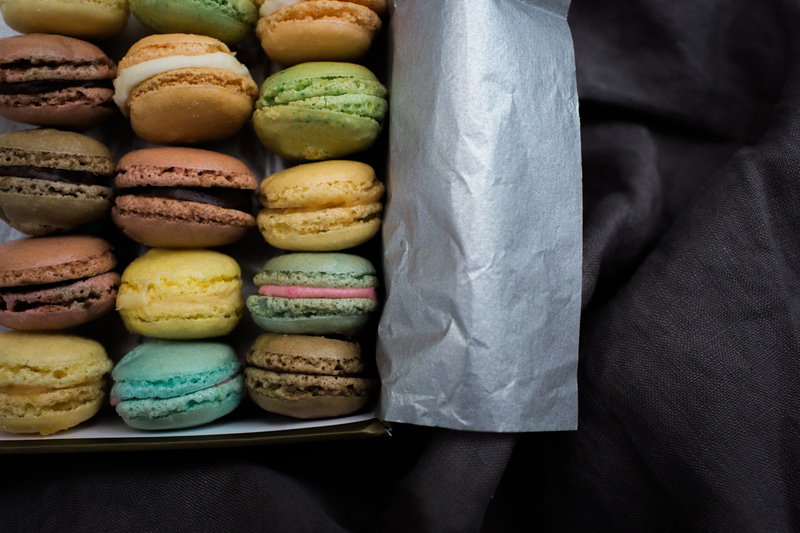 Once fully cooled down, you can match the macarons into suitable pairs and fill with your desired fillings. These can vary widely depending on what you fancy. Nutella would be an easy choice, but Nangi being a seasoned pro had already prepared home-made passionfruit curd, lime curd, lemon curd, salted caramel, chocolate ganache, butter cream infused with rose flavouring. 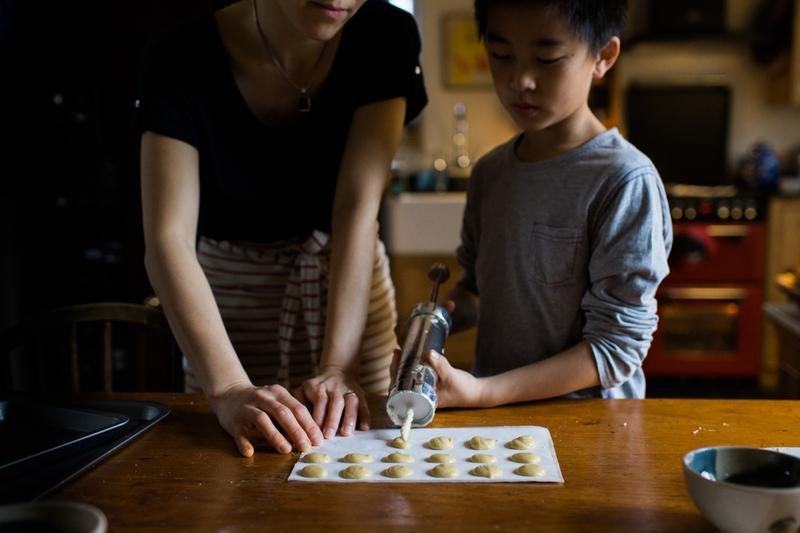 Nangi's advice is that the drier the ingredients the better for everything macaroon-related. 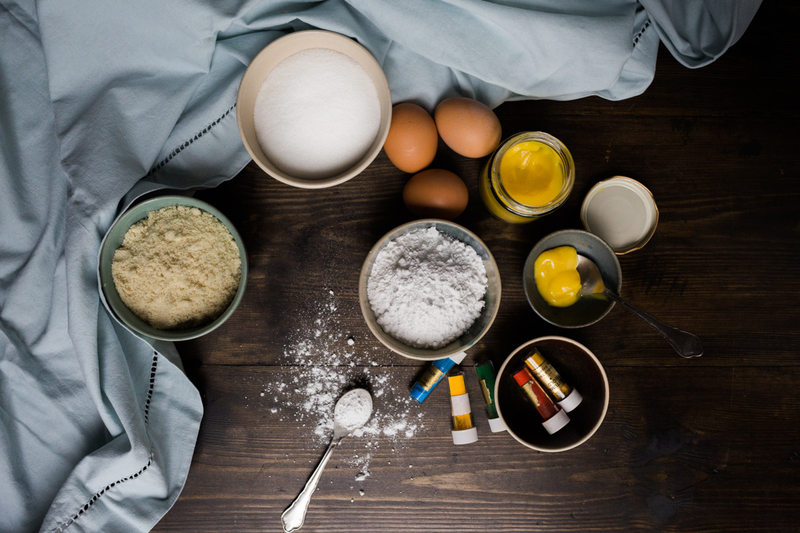 The egg whites should be dried in a bowl at room temperature for at least 3 days before you plan to make the macaroons. Almond flour is apparently the best to use, but Nangi uses ground almonds and makes sure that they are blitzed in the food processer before using them. She then dried the almond flour on a tray for a day or so in the cupboard before using to ensure that it was completely moisture-free.. 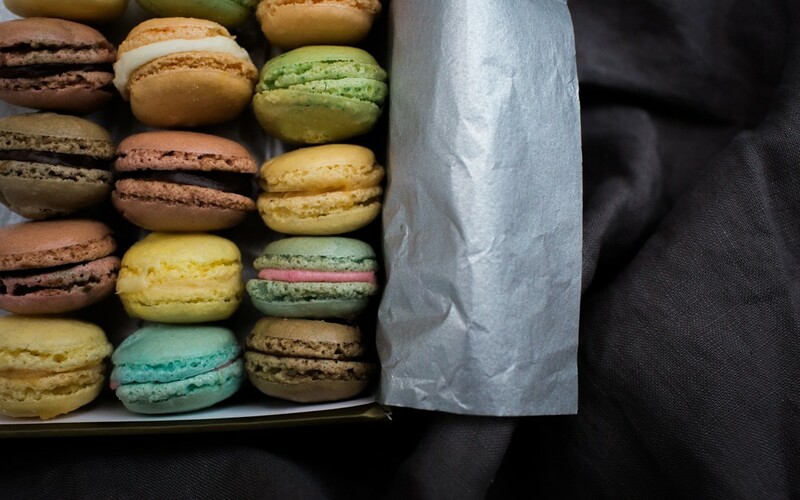 Cooking time can vary slightly for each oven, so keep a close eye on the macaroons and once they have formed a type of frill at the base they should be ready to come out of the oven. Cooking time is usually approx. 12 minutes for a fan oven. I'm based in Davon, South West England. Nutritional Therapist and photographer, Mum of three girls. Passionate about health, good food and family. They look beautiful and I bet they tasted good too… Nangi is one multi-talented lady! They did indeed thanks Phoebe!